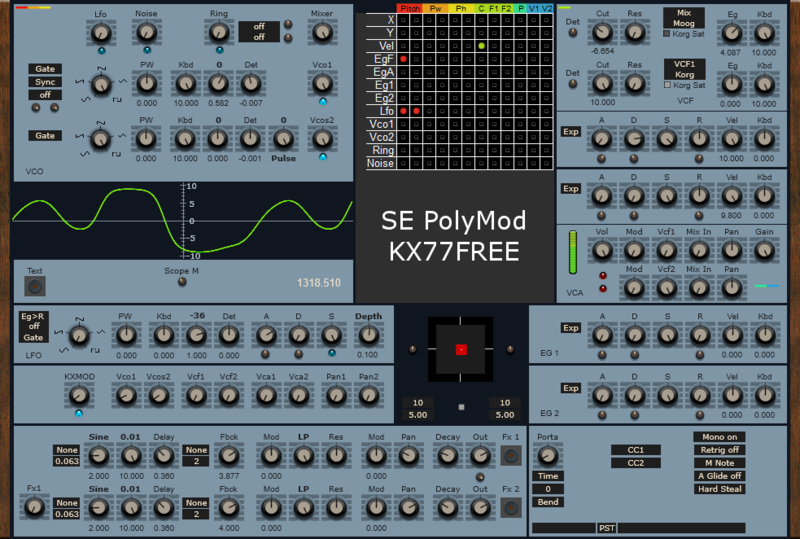 KX77FREE has released the SE PolyMod KX vintage polyphonic synthesizer to build analog 70's leads. Built for help SE community, based only on SE modules. Alpha release available for Mac users. 3 VCOs with 5 waveforms and Sync (Vco1 only). 5 Keyboard tracking (-10 to 10) for the VCOs and the VCFs. 1 Ring Modulator with EQ. 1 Monophonic LFO with ADSR (possible to use it like an oscillator). 2 Mulitmode VCFs (SVF, Moog, Korg with saturator). 4 Polyphonic EGs with velocity and Kbd controls. 1 X Y joystick controller. 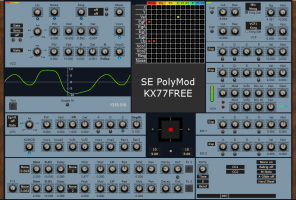 2 Delays with host sync, multimode filter and modulation oscillator with host sync. Internal FXP and FXB management.